Viewing the Northern Lights is on everyone’s bucket list. To many it is a dream to feel the cold against their cheeks and gaze up at the unearthly colours dance to a ballet against the dark starry sky. The mystical phenomenon is explained by the scientists as a result of collision between electrically charged particles from the sun that enter the Earth’s atmosphere. These night lights are known as Aurora Borealis in the north while in the South they are called Aurora Australis. Here are 21 places to see the Northern Lights in the world – Many in Norway, some stunning ones in Iceland and even so far as Russia – all through the eyes of Instagram travellers! At Pickyourtrail we help you get those super-customized vacations. So, don’t forget to drop us a note! There are quite a lot of places dotted around Norway’s map where you get to view the Northern Lights. For the natives, it is an everyday thing. Tromso is a bustling and alluring city that has the highest probability of seeing the lights due to the Northern Lights Oval. If you want to go dog-sledding or whale watching excursion, Tromso city is the place. Feel peace and tranquility while you watch the Northern Lights in the Lofoten Islands. It has colourful fishing villages, local handicrafts and a rich history that dates back to the Vikings. The wild nature of the island is just as beautiful in winter as the rest of the year, especially when the northern lights come out at night. The coastal areas of Lofoten are often the best locations for shooting the Northern Lights. Take a safari by RIB boat for a unique experience. Wondering if Norway is a good place to go? Here are some stunning pictures of Norway at its best! It is the ideal holiday destination! Get an authentic and arctic impression in Narvik while on a cable car that carries you atop the mountain to view the Northern Lights. You can also go on a scenic train journey with the Ofotbanen railway towards the Swedish border. At the Polar Park Wildlife Centre you can visit the bears, wolves, wolverine, lynx, moose, reindeer, musk oxen and Arctic foxes. In 2016. a cabin called “wolf lodge” has been constructed to sleep within one of the wolf enclosure. Now, that would be a terrifying yet exhilarating experience! In the dry Lyngenfjord region you can experience the Aurora Borealis within its beautiful landscapes. Their very nature is unspoiled with thick fauna surrounding it. You can go Northern Lights hunting with a renowned photographer and sleeping in a glass-ceiling Crystal Lavvo designed for gazing at the night’s sky. The mountains are great for downhill skiing too! Here are a few places where you can go on a road trip. This is known as the northernmost point of Europe. For a breathtaking scenery of wild beauty visit North Cape and go snowmobiling while looking out for the Northern Lights. This ethereal experience will be like balm to your soul. You can explore the ruggard beauty of the landscapes while ice fishing or ATV driving. This is a once in a lifetime adventure! Visit Svalbard- the winter wonderland when the nights are dark and dry and it is the only place where you can go on an aurora hunt in daylight. During the polar night, the Aurora Borealis may even appear at lunchtime. Dog sledding in Spitsbergen and glacial ice caving are special experiences to add to your never ending list. Do not forget shopping is TAX-FREE!!! The Ice Hotel in Jukkasjärvi, Sweden and the Aurora Sky Station work together and offer package deals to view the Northern Lights in Abisko and visit the beautiful Ice Hotel. The best time to see is from September to March, away from the city lights and in the wilderness as the aurora favours clear skies. We guarantee you, it will be a breathtaking and life altering experience as you are drawn into its endless pit. Ever thought of sleeping inside a transparent bubble while you wait for the Northern Lights to make its appearance? Yes, in Reykjavik this is possible. You can also visit the hot geyser in Strokkur where it sprouts hot spring every 5 minutes and soak or float in the Secret Lagoon at Fludir. The best season to see the Northern Lights in Iceland is from September to mid-April where full dark nights are guaranteed. Here are other reasons on why you should visit Iceland. Whitehorse in Yukon with its natural beauty is one such place in Canada that has the privilege of showcasing the Northern Lights. Watch the flickering Northern Lights burst into thousands of colours that present a visual enjoyment of contrasts, hues and tones. A heated cozy cabin, wall tent, or a seat beside the campfire? Which is your choice? Get treated to a dazzling display of Aurora Borealis in Alberta. It is also home to the world’s two largest dark sky preserves. Experience the crisp night air at Fort McMurray while you stay warm in your winter gears excited to watch the northern lights at last! You can also snowboard or ski across the Albertan landscapes. Don’t forget to visit the National and Provincial parks in town to see the natural predators and many more! Here are a few places to encounter wildlife. There is a 90 per cent chance of viewing the northern lights in Yellowknife in the Northern Territories of Canada as the province is less populated. The city and surrounding area is situated directly beneath the aurora oval. Due to clear skies and darkness the below mentioned seasons are best to view them. Watch the natural phenomena from the Kakslauttanen Arctic Resort, Finland. The neon green colour will light up the sky through your igloo’s glass roof or you can chase the colors unfurl on a horseback or horse drawn carriages. Isn’t that the most exciting experience? Have a look at the perfect Finland itinerary here. 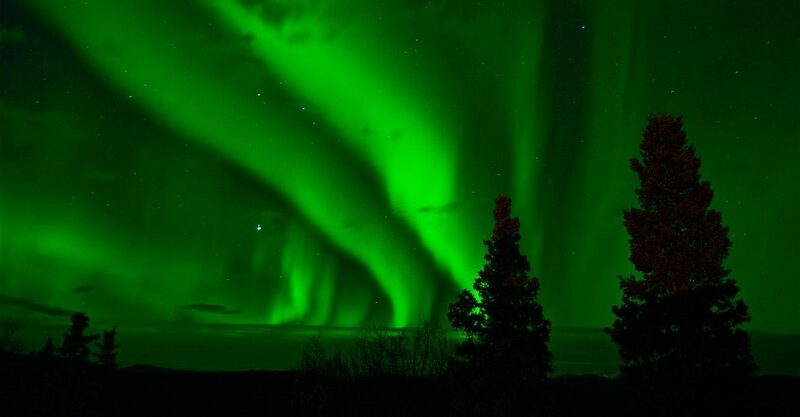 You can also view this pulsating chorus of neon colors from Ivalo where you are offered safaris and various kinds of outdoor winter activities. Hire an Aurora Hunter if you want to find the perfect spot to view the lights. You can also go trekking, ice-fishing or snowmobiling. Kangerlussuaq, meaning ‘Big Fjord’ in Greenlandic serves as the main gateway to the island. You can experience the multi-coloured light show at Kangerlussuaq too. Want to experience wilderness and the Aurora Borealis? Then Kangerlussuaq is the place! It is also home to an array of wildlife including musk oxen, caribou, and gyrfalcons which regularly roam the Arctic countryside. Ilulissat means “iceberg” Aurora Borealis is one of the great surprises of the Arctic night, and you can experience this at Ilulissat. It is also known for its winter sports particularly husky sledding. Ilulissat attracts tourists for its ice fjord, it is one of the fastest moving and active glaciers in the world. My first night in Greenland was spent shooting outside whilst receiving funny and suspicious looks from the locals. A well-known legend relates that when the northern lights dance in the night sky, it means that the dead are playing football with a walrus skull. Northern lights are part of the visual, physical characteristics of Greenland, you can watch them in Nuuk. The northern lights, is Russia’s way of adding an extra bonus to the adventures of winter. Severodvinsk is renowned for having some of the brightest lights in Russia, with red and green glows even visible from inside the city. Severodvinsk that claims the status of Russia’s science city, offers guided tours during the winter months to see the northern lights. The Northern Lights appear every winter over Lake Lovozero in Kola Peninsula. Russia being the largest country below the north pole, it houses several “spots” for watching the northern lights. In the north of the Kola Peninsula the Northern Lights can be seen up to 200 times a year. February to March or September to October. When the nights become cooler and longer the aurora takes its cue to begin the lights show. But in Alaska you need not worry about the perfect spot to view the lights for they can be seen all over the state especially in Fairbanks where they are frequently seen. Since the ancient times the Aurora Borealis beckoned the people by its mystical mysterious light, many legends and tales were created on this phenomenon. One can never get enough of the blazing colors in the sky. The best spot to hunt the Northern Lights in Ireland is Dunree. There’s no light show in the world like it. No amount of modern shimmering screens, zapping lasers or spinning disco balls can match mother nature’s sky show. Malin Head is known as Ireland’s northerly point place where you are more likely to view the northern lights. Be sure to sip on an Irish coffee after your excursion. Catch these views for yourself with Pickyourtrail. For more travel inspiration, follow Pickyourtrail. Santa Claus village – The official home of Santa Claus!